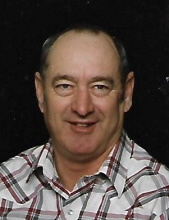 Donald Lester Robertson, 77, of Lakewood, Illinois passed away at 5:15 p.m. on Sunday February 10, 2019 at Carle Foundation Hospital in Urbana, Illinois with loved ones by his side. Donald was born January 16, 1942, in Dry Point Township, the son of Thomas Donald and Nancy Pearl (Watson) Robertson. He married Judith Ann Behnke on November 17, 1979 in Iuka, Illinois and were blessed with 39 wonderful years together. Donald worked for Hanfland Gravel Pit in Shelbyville for 18 Years, Jones Trucking Service in Stewardson for five years, Illinois Department of Transportation in Shelbyville for 18 years, and part-time for Lakewood Township Highway Department for over 30 years. He was a 3rd Degree Master Mason, Master of Clover Leaf Lodge #990 of Herrick in 1983, was currently serving as Marshal of Clover Leaf Lodge #990 of Herrick and was a 40-year member of the Masonic Fraternity. Donald was also a member of the Order of the Eastern Star Chapter #860 of Herrick and Arcana Chapter #493 of Pana. Donald loved to travel with his wife Judith and son Chad. He also enjoyed going to lodge meetings, taking naps, watching television, working in his vegetable garden, tending to the lawn, and working on the Lakewood Township roads. Surviving are his wife, Judith of Lakewood; sons: Chad A. Robertson of Lakewood, Donald R. Robertson of Hannibal, MO and Craig Robertson of Moweaqua; mother, Nancy Chamberlain of Herrick; sister, Beverly England of Tampa, FL and several grandchildren, aunts, nieces, nephews, cousins and uncle Kenny Barr. Preceding him in death were his father and one son. Funeral services will be held at 1:00 p.m. on Friday, February 15, 2019 at Lockart-Green Funeral Home in Cowden with Pastor Nick Robertson officiating. Burial will take place in Mound Cemetery in rural Cowden. Visitation will be from 4:00-7:00 p.m. on Thursday, February 14, 2019 at Lockart-Green Funeral Home in Cowden. Masonic rites will be held at 7:00 p.m. by the Clover Leaf Lodge #990 of Herrick. Memorials may be made in Donald’s name to Clover Leaf Lodge #990 of Herrick. Family and friends are invited to light a candle or share a story in Donald’s honor at www.lockartgreenfuneralhome.com. To send flowers or a remembrance gift to the family of Donald L. Robertson, please visit our Tribute Store. "Email Address" would like to share the life celebration of Donald L. Robertson. Click on the "link" to go to share a favorite memory or leave a condolence message for the family.